The Algos is the Gallente destroyer added in the Retribution expansion. It is the second step on the Gallente drone boat path, between the Tristan and Vexor. Unlike the Catalyst it is capable of fitting a full flight of salvage drones in addition to a rack of railguns. The Algos is an excellent choice for L1 mission running. Unlike larger ships (e.g. the Vexor), the Algos is designed to be flown with very low skill points; with that in mind, it is the only drone ship where Drones V is not an absolute necessity - although it should still be a top priority for new Gallente pilots. The Algos is a versatile destroyer, capable of running either rails or blasters while pushing through a respectable amount of DPS. Further information about additional or recommended skills to pilot Algos for a specific or its common role(s) can be written here. "Warp to 20" - this is the Algos' pilot motto. Take the official description of this destroyer to heart and fly it that way. 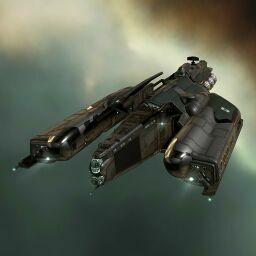 You might have more EHP and tank than a frigate but you are still not a brawler and not as nimble as a frigate. In PVE and PVP your damage is best done at range where you can tactically evaluate the situation and direct your drones to where they are most needed and manage your ship's propulsion mods and defense mods as necessary. PvP: Fit a Microwarpdrive, Cap Boosters or anything that will keep your cap topped off in combat. If you happen to be squad/wing/fleet warped right on top of the enemy - turn and burn away, set your drones to do their thing on the Primary and make sure they are set to Passive mode. This means they will not agress anything that you don't purposefully tell them to. (This applies to PvE as well). Keeping your situational awareness as a droneboat pilot is doubly as important as for a gunboat pilot; he won't lose his primary dps if the FC orders a fast retreat and you're forced to leave your drones behind. It doesn't hurt to keep a flight of spare drones (or different variants) in your cargo hold to swap out if you dock up. PVE: Level 1 missions are a breeze with the Algos. Level 2 are more of a challenge, but still possible once you have experience and EVE Survival website opened and start fitting for specific missions. Level 3, you will need to fleet up with big friends - these are meant for Cruisers and Cruiser gangs. If you are at this point, leave the Algos behind and graduate to the Vexor. Algos blueprint stats corrected to be in line with other destroyers. The Algos ship description has been altered to make it clearer. The Algos is the new drone Destroyer for the Gallente. Combining a class-leading 35mbit of drone bandwidth with bonuses to drone damage/hitpoints and drone speed makes the Algos deadly at flexible ranges. A hybrid weapon tracking bonus fits perfectly with small railguns to add extra ranged damage to the Algos’ column. This page was last modified on 23 March 2019, at 12:53. This page has been accessed 355,980 times.